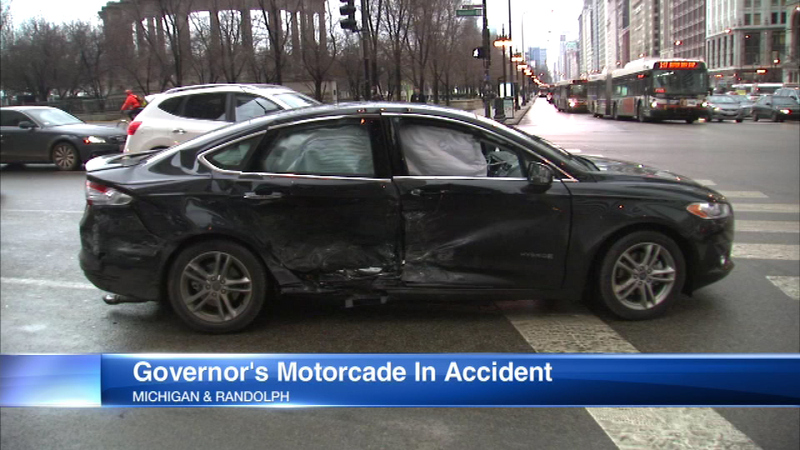 Governor's motorcade involved in crash on Michigan Ave.
CHICAGO (WLS) -- Illinois governor Bruce Rauner's car was struck when a two-vehicle car crash occurred in the intersection of Michigan Avenue and East Randolph Street. Illinois State Police say the governor's motorcade was stopped a red light when a two vehicle crash occurred directly in front of them. One of the vehicles spun out of control after the crash and slid across the intersection, striking the vehicle in which Gov. Rauner was riding with ISP officers and another vehicle. Police say neither the governor nor any officers were injured in the crash. The vehicle carrying Rauner was damaged as well. ISP official say a total of three people involved in the initial crash were transported to Northwestern Medical Center to treat non-life threatening injuries. Chicago police responded to the scene of the accident to handle the crash.